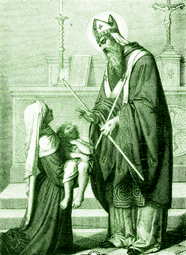 Saint Blaise devoted the earlier years of his life to the study of philosophy, and afterwards became a physician. In the practice of his profession he saw so much of the miseries of life and the hollowness of worldly pleasures, that he resolved to spend the rest of his days in the service of God. From being a healer of bodily ailments, he became a physician of souls, then retired for a time, by divine inspiration, to a cavern where he remained in prayer. When the bishop of Sebaste in Armenia died, Blaise, much to the gratification of the inhabitants of that city, was chosen to succeed him. Saint Blaise at once began to instruct his people, as much by his example as by his words, and the great virtues and sanctity of the servant of God were attested by many miracles. From all parts, the people came flocking to him for the cure of bodily and spiritual ills. When the governor of Cappadocia and Lesser Armenia, Agricolaus, began a persecution by order of the Emperor Licinius, Saint Blaise was seized. After interrogation and a severe scourging, he was hurried off to prison. While he was under custody, a distraught mother, whose only child was dying of a throat disease, threw herself at his feet and implored his intercession. Touched at her grief, he offered up his prayers, and the child was cured. The prisoner was brought before Agricolaus again for further questioning, and again was whipped while tied to a pillar. He was spared from drowning when thrown into a lake; the governor ordered then that he be beheaded. At the execution site he prayed aloud to God for his persecutors, and asked that in the future those who would invoke him might be aided, as he had been permitted to assist them during his lifetime. Our Lord appeared to him and said in a voice which all bystanders heard, that He granted his prayer. Since that time his intercession has often been effectually solicited, especially in cases of all kinds of throat problems. Reflection. There is no sacrifice which, by the aid of grace, human nature is not capable of accomplishing. When Saint Paul complained to God of the violence of temptation, God answered, My grace is sufficient for thee, for strength is made perfect in infirmity. To him who asks of you, give; and from him who would borrow of you, do not turn away.